Gobekli Tepe is a civilization site over 10,000 years old in Turkey right smack between the Tigris and Euphrates rivers, northern Mesopotamia. Later inferiors, strangely, buried it. Excavations started in 1995, and multiple sites exist in the area. I and others have commented on its civilizational significance. According to my favorite book, Adam and Eve arrived 38,000 years ago as biologic uplifters of humanity. They settled in “the Garden of Eden” on a peninsula jutting out from the eastern coast of the Mediterranean Sea approximately due east of present day Cyprus, and since submerged due to tectonic plate shifts. As the story goes they defaulted in their mission and an impending invasion by Nodites (yes, the same tribe from which Cain took himself a wife after running off in consequence of slaying his brother Abel) required them to leave for the second garden. Gobekli Tepe is in the same general area, albeit a bit north. The Tigris and Euphrates rivers make natural boundaries to keep hostiles at bay, and they approach within 50 miles of each other in southeast Turkey at Hantepe (Tigris) and Konacik (Euphrates) about 50 miles north and a little east of Gobekli Tepe, and in the area of Baghdad, Iraq. 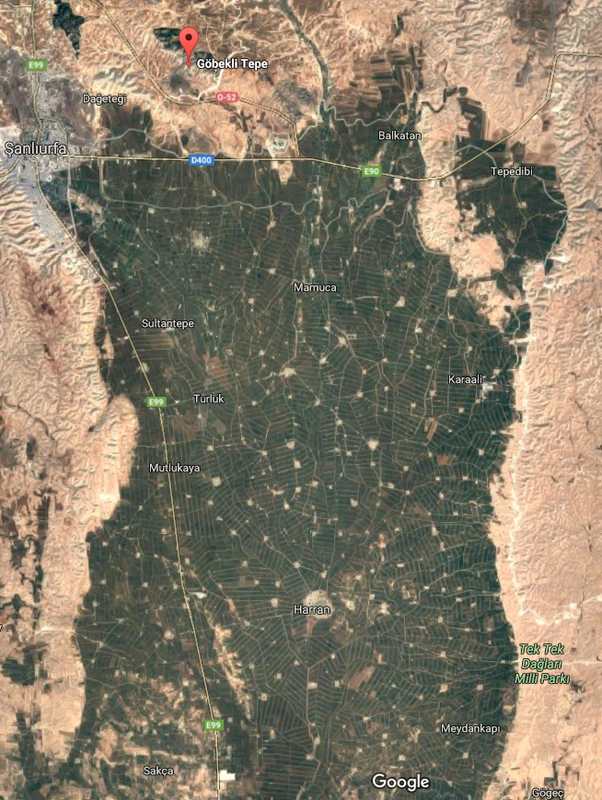 A very fertile area sits in eastern Syria, immediately 80 miles south of the northernmost approach of the two rivers to each other, and in numerous area in between. The star sits at Gobekli Tepe. 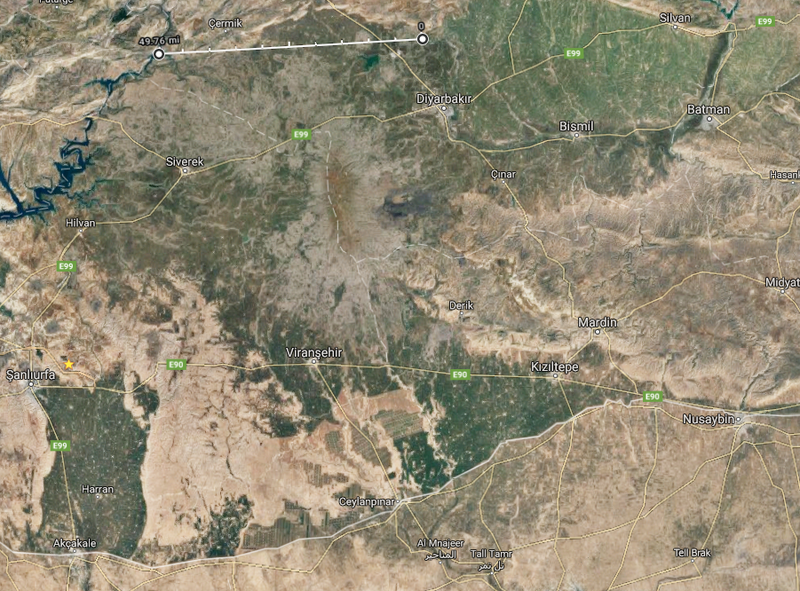 If it took Adam and Eve a year go travel 100 miles from the first Garden of Eden to the Euphrates river, it would have taken several years to reach the area of Baghdad, so I imagine they ventured northeast another 60 or 80 miles to reach the site of the Second Garden site. Gobekli Tepe’s ruins seem to suggest the influence of superior beings like Adam and Eve and their progeny on the ancestry of those who created the civilization at Gobekli Tepe. I’m guessing the apple did not fall far from the tree. The line drawn in the image below shows the distance between the Tigris (right) and Euphrates (left) rivers. The white line running left to right at the bottom is the border between Turkey (north) and Syria (south). Based on the comments in The Urantia Book I’d guess the site of the second garden at the area south of Siverek because it is crisscrossed by numerous rivers, it is a fertile valley, and it has mountains to the east (to which former occupants of the valley fled).